Since 1924, the Thanksgiving Day parade has been a spectacle in New York City. Millions of people gather to watch the parade balloons, marching bands, and floats go by the streets of Manhattan, with a chance to see Santa at the conclusion. Planning for the event is year round, but one of the items that can’t be planned for completely is the weather. Here we take a look at the highs and lows of weather that occurred on Thanksgiving day in New York City. 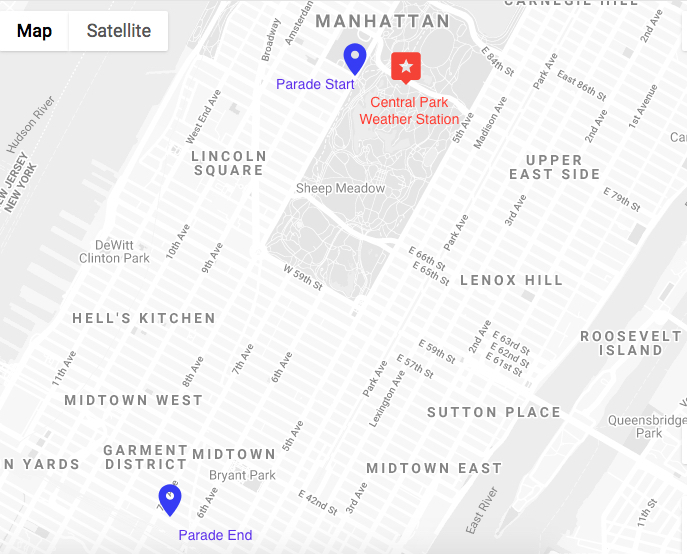 Usually, the parade begins on W 77th Street, and moves southward on the western edges of Central Park. It then turns onto 6th Avenue, and follows that all the way down to 34th Street, before it concludes at the famous Macy’s in Herald Square. Luckily enough, there is a weather station that presides in Central Park, just near the start of the parade. This station reports numerous weather variables, and has been in existence since 1869! For this analysis, I grabbed daily summary information for all thanksgivings between 1924 and 2017. Below is a graph showing the results of temperature and precipitation. According to 30 year normals data, daytime maximum temperatures at the end of November for Central Park are typically in the 50s, while overnight minimum temperatures are usually in the upper 30s. One wouldn’t be able to prove this on the chart above. 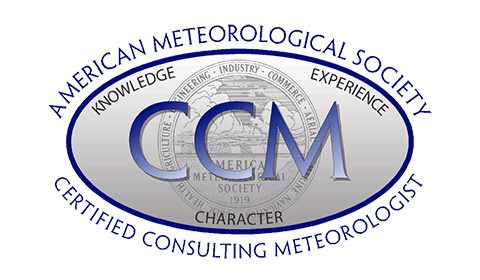 There is a lot of year to year fluctuation, with some years being really warm, and others being really cold.. It’s important to remember that what climatologists call typical (or normal) is based upon an average of thirty years of weather data. The 50s and 30s indicated above is based upon an estimation between 1981 and 2010. This is a really good representation when scientists talk about the difference between weather versus climate. Climate is what you expect, weather is what you get. Overall, 14 out of the 94 parade days experienced a high temperature in the 60s. The highest occurred in 2007, when the high temperature hit 66F for that day. There are 12 frigid parade days, with the high temperature reaching 40 degrees or lower. The days with the coldest high temperature occurred in 1989 and 1996 when the high temperature was only 31 degrees. 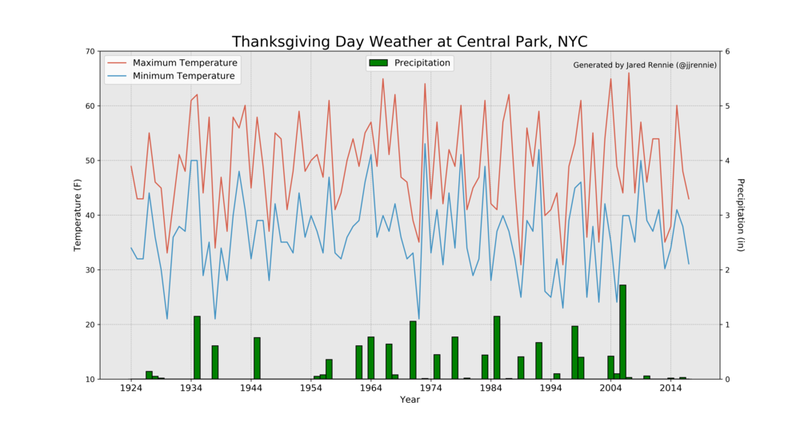 There are 33 times when measurable precipitation occurred in Central Park on Thanksgiving day. Now this could have occurred anywhere in the 24 hour period of Thanksgiving, but it can still be a general sign of dreary conditions for spectators. There were 4 years with precipitation greater than 1” (1935, 1971, 1985, 2006) and the wettest Thanksgiving occurred on November 23rd, 2006, when 1.72” fell. Surprisingly enough, there were only three parade days when it snowed. There was a dusting in 1996, 3.9” in 1938, and the record goes to 1989, who recorded about 4.4.” Nonetheless, people still stood outside and enjoyed the parade, with about 1.8 million estimated spectators that year. Probably the biggest issue for parade organizers is the wind, as strong gusts can tear holes and generate erratic behavior for large balloons. Reliable reports of wind speed did not occur in Central Park until 1965. Nonetheless, winds are usually blustery this time of the year, with the lowest peak wind gust occurring on Thanksgiving day in 1992, at 10.3 mph. There were 6 parade days since 1965 the peak wind gust was over 30 mph. The three worst days occurred in 1971 (max gust of 60 mph), 1997 (41 mph), and 2013 (39 mph). In 1971, the strong winds forced the balloons to not fly that year. To date, this was the only time balloons were grounded since they started using them in 1931. They probably should have done the same thing in 1997, as the strong gusts tore open some balloons, and lead to a few injuries. Overall, if you ever get the chance to see the parade in person, expect fall like conditions. There will most likely be a chill in the air and little to moderate wind. If you get lucky, you might see warmer than normal conditions, but at the same time you might also see a few inches of snow. Unless the winds are too strong, I would say it’s worth going, no matter what the forecast brings.